It is lucky for me to have chance to visit the demilitarized zone between North Korea and South Korea from both side in recent four years. On both side, they share some similarit that both side have military structures booming shrubs and trees and farmland in the mountain. However, there is also something different of sceneries on both side. For example, In South Korea, there is some symbol of physical connection for the both sides, including an abandoned train line which cannot share the view from the north Korea. and people on both side always talk about a mountain named kumgang mountain, which crowing the border between the two countries, 2/3 in North Korea and 1/3 in South Korea. The mountain became a symbol of combination? and culture identity in perception for people on both side. Just like the diagram 1 show on here, the eastern countries, especially japan, china and Korea peninsula, culture value and nature beauty could not be divided into two part in most of the national parks. Compared with the national parks in eastern countries, most of the national parks in western firstly focus on the nature beauty, and the system of national parks is a rethinking of the importance of the nature value after the industrial revolution. Therefore, the formation process for is different for national park in eastern and western countries and the perception of national parks or mountain is different in their mind. The kumgang mountain is a typical example of the different perception. The mountain is physically divided into two part due to Korea war on 27, July 1953, after signing the armistice of United Nations, china, North Korea and South Korea. But it cannot be divided in people ‘s minds. The border of DMZ is not an abstract line, it’s always experienced temporal and spatial shifting. In my research, i started unfolding the dmz into three layers. First, the line is keep changing historically,in the year 1921, Japanese constructed a train line cross the king king dao province, which is the dmz zone now. 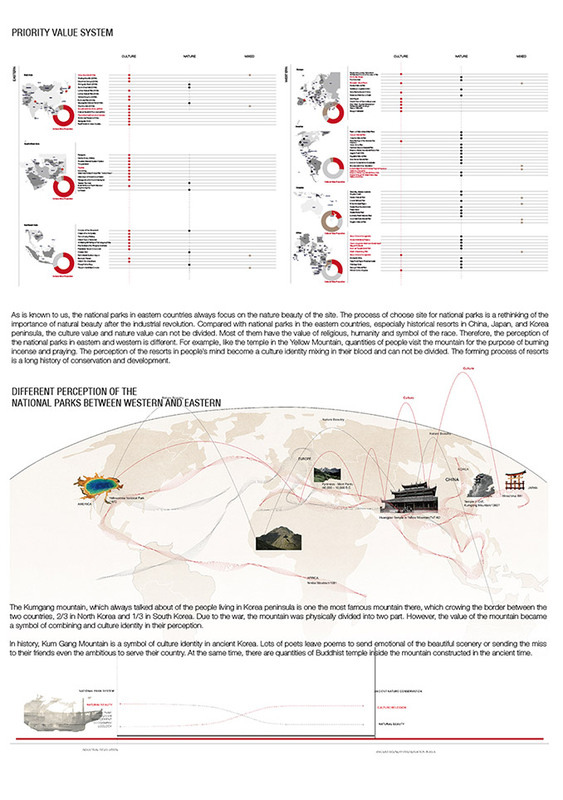 in 1945, the United Nations draw a line on 38 Parnel to liberate the people from Japanese colonial time. and it was shifting the shape at end of the korea war in 27 July, 1953. Secondary, Legally, the border should be 2km offset both side from the line. However, there always happened different operations. Before 1953, the eastern part was flourish for fishery. 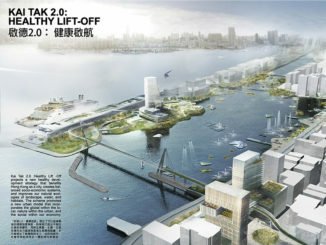 After 1953, the fishery was abandoned by the local fisherman though there is a rule in the armistices that the Hanjiang river can open to both side people for the fishery. And in the year 1993, the south Korean government left a 60km burning scar for the purposes of leaving the local residence and expand territory. And Due to there is a famous mountain in the eastern DMZ, the places preserved through different government from the colonial time of Japanese. It can be visited from both side before 1953 and between 1998 and 2008. Thirdly, The DMZ is not just a line or even a zone, it is closely related to the culture and geographical of the region. 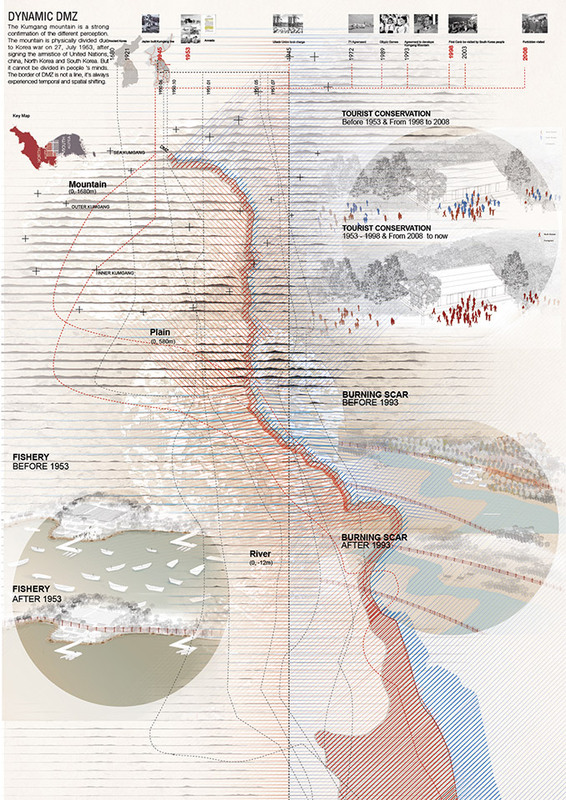 the DMZ can be divided into 3 sectors, mountain DMZ, river DMZ and Plain DMZ based on its topographical feature. For the discourse, the dmz is dominated by the geopolitical discussion, and this project is to revisit the nature and culture of dmz.the dmz is not only a military landscape, it is a place with great value that need to be preserved and engaged with. And i ‘m focusing particular of the mountain sector of dmz, because it has strong culture and nature and even economical value. And there also some people survival in the zone. The value of the mountain can be dramaticall divided into 3 parts, which is Sea Kumgang, Inner Kumgang, and Outer Kumgang based on its historical meaning and the topographical feature. In the perception of the psychological value of connection, The sea kumgang famous for its scenery beauty between the ocean and land. As for the Outer Kumgang, the Japanese government constructed Kumgang Line for the purposes of both transporting mineral from inner land to the port and benefit the Japanese to visit Kumgang Mountain. There are also hotel and highway constructed. Therefore, it has the feature related to the construction of infrastructure. And for the inner KUmgang, it famous for the value of religious and culture. There are lots of buddha carvings and temples in the inner part. For the physical connections of train line, there is a bridge for pass train in the past. There also some infrastructure, which has the meaning of connections, just like the train stations, And for the visual connection, there are vegetation here, and the main species are presented in the bar. For examples, like the pinus, which is a symbol of the spirit of korea people. Even, there is some nature habitat changing. people can watch the operation at North Korean logging, transfroming the forest to farmland. 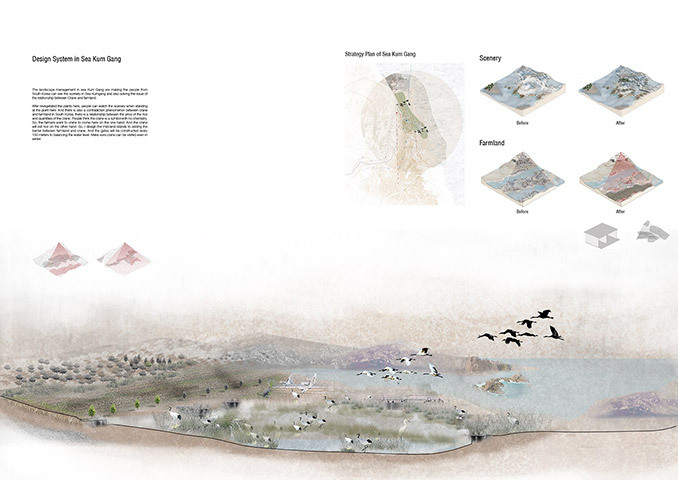 There also has ecological change, some icon of physical connection from the both side and crane flying over the DMZ. 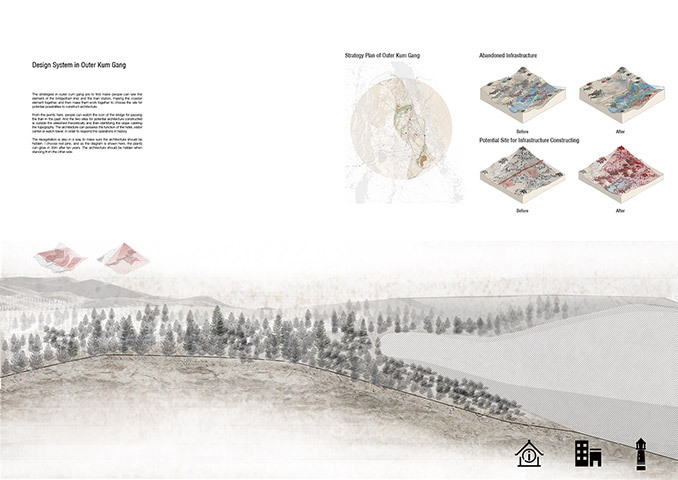 There is visual connection of the place both physically and psychologically, and the viewshed can be used to reframing and curating the dmz. 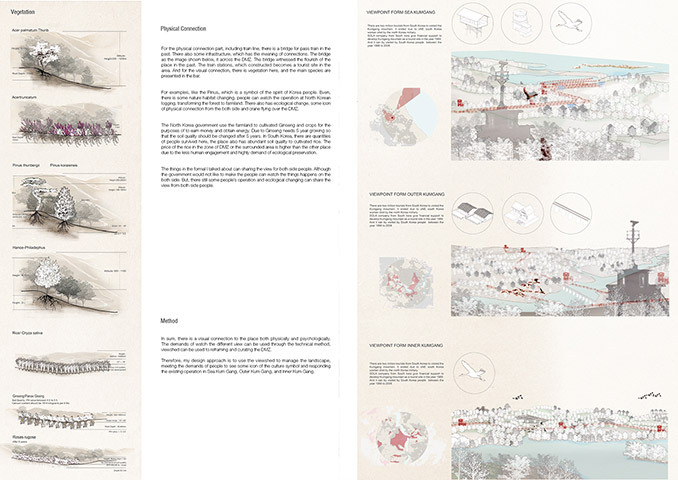 Therefore, my design approach is to use the viewshed to manage the landscape, meeting the demands of people to see some icon of the culture symbol and responding the existing operation in Sea Kumgang, Outer Kumgang and Inner Kumgang. After doing the calculation of the viewshed(image5) from both two side, I select 8 points from each sides. The 16 points can make sure people can see most of the icon of culture value of the place in theory. The strategy is to define the place of opening view and hidden view. And here is the elevation of the each point. As for responding to people’s operation agriculture, revegetation and a potential site for infrastructure construction, guiding people how to use the land.for the opening view, it is inside the vieshed, the slope can be used to guide people where can be used through slash and burn system. Ginseng can be cultivated between the range of 15 to 38 degree. 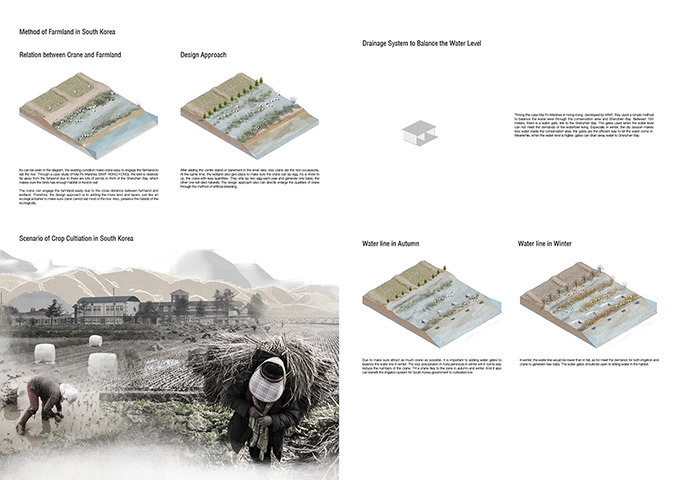 Crops in Korea peninsula can be cultivated on the slope between 18-30 degree and the architecture can cater the slope between 0-6degree on the mountain. 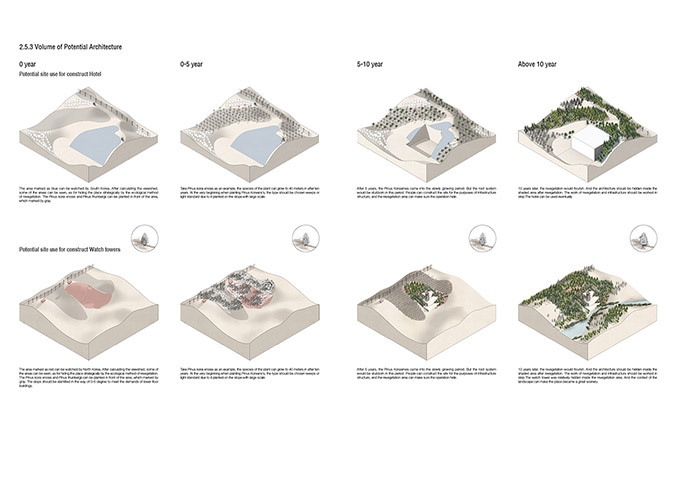 And the slope is to idenified the volume of the each potential site for infrastructure or architecture construction. The landscape management, all these element are integrated, and the way i linking this of the characteristic of sea kumgang, outer kumgang and the inner kumgang. 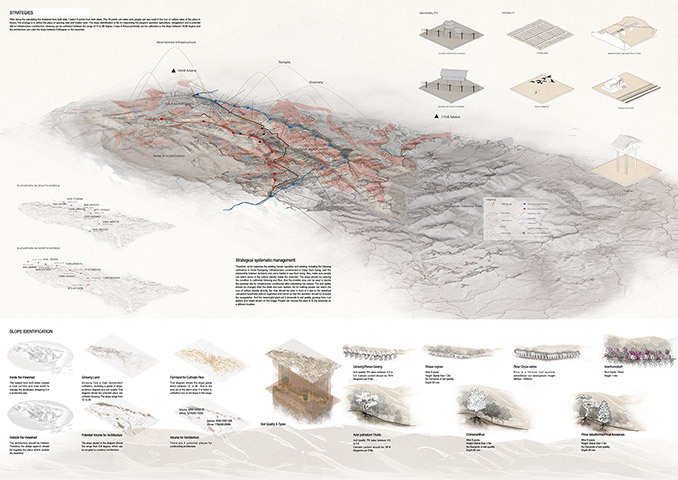 The diagrams show on here is to tell How the loging of cultivation or revegetation and construction of infrastructure or architecture are coralated based on the viewshed, and they are not seprated system. Here is the design strategy or approaches in details is to tell people where they should be logged and where they could used as constructions of infrastructure. Sea Kumgang: scenery broader view for scenery. The landscape management in sea kumgang are making the people from south Korea can see the scenery in Sea Kumgang and also solving the issue of the relationship between crane and farmland. After revegetated the plants here, people can watch the scenery when standing at the point here. And there is also an contradiction phenomenon between crane and farmland in south Korea, there is a relationship between the price of the rice and quantities of the crane. People think the crane is a symbol with no chemistry. So, the farmers want to crane to come here on the one hand. And the crane will eat rice on the other hand. So, I design the mid-land islands to adding the barrier between farmland and crane. And the gates will be constructed every 150 meters to balancing the water level. Make sure crane can be visited even in winter. 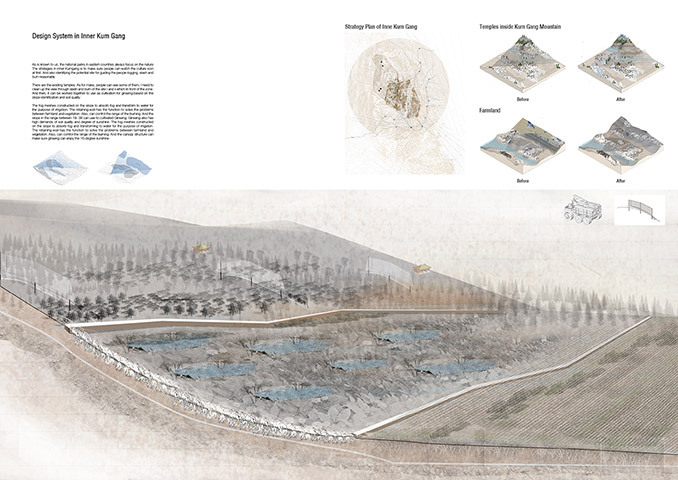 Outer Kumgang: infrastructure, revegetation for hidden and volume for architecture. The strategies in outer kumgang are to first make people can see the element of bridge(train line) and the train station, making the coaster element togethere, and then make them work togathere to choose the site for potential possibilities to construct architecture. From the points here, people can watch the icon of bridge for passing the train in the past. 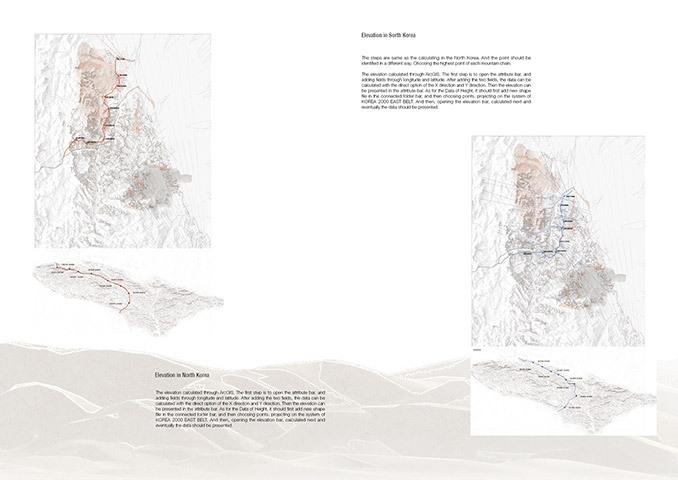 And the two sites for potential architecture constructed is outside the viewshed theoretically, and then identifying the slope catering the topography. The architecture can possess the function of the hotel, visitor center or watch tower, in order to respond the operations in history. The revegetation is also in a way to make sure the architecture should be hidden. I choose red pine, and as the diagram shown here, the plants can grow in 30m after ten years. The architecture should be hidden when standing from the other side. Inner Kumgang: temple, ocastrating the logging and slash and burn system. The strategies in inner Kumgang is to make sure people can watch the culture icon at first. And also identifying the potential site for guiding the people logging, slash and burn reasonably. There are the existing tempes. As for make people can see some of them, I need to clean up the view through slash and burn of the site i and ii which in front of the zone. And then, it can be worked together to use as cultivation for ginseng based on the slope identification and soil quality. 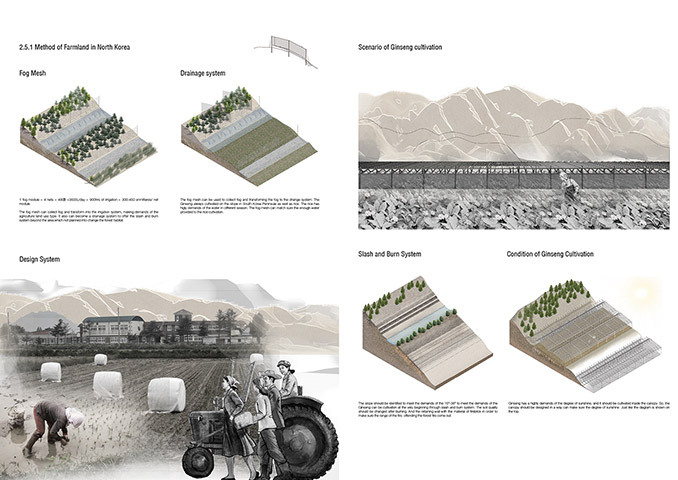 The fog meshes constructed on the slope to absorb fog and transform to water for the purpose of irrigation. 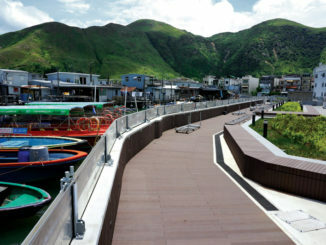 The retaining wall has the function to solve the problems between farmland and vegetation. Also, can control the range of the burning. And the slope in the range between 18- 38 can use to cultivated Ginseng. Ginseng also has high demands of soil quality and degree of sunshine. The fog meshes constructed on the slope to absorb fog and transforming to water for the purpose of irrigation. 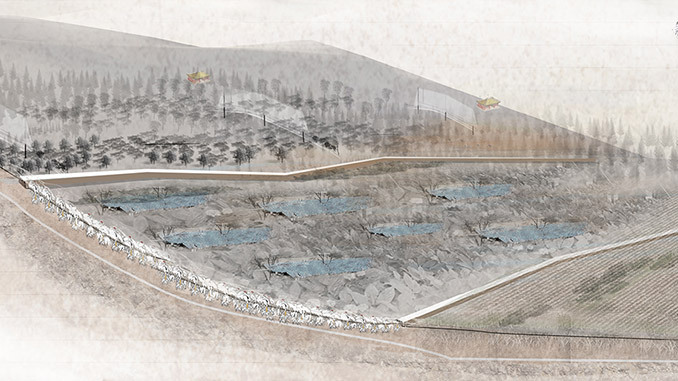 The retaining wall has the function to solve the problems between farmland and vegetation. Also, can control the range of the burning. And the cannopy structure can make sure ginseng can enjoy the 15 degree sunshine. 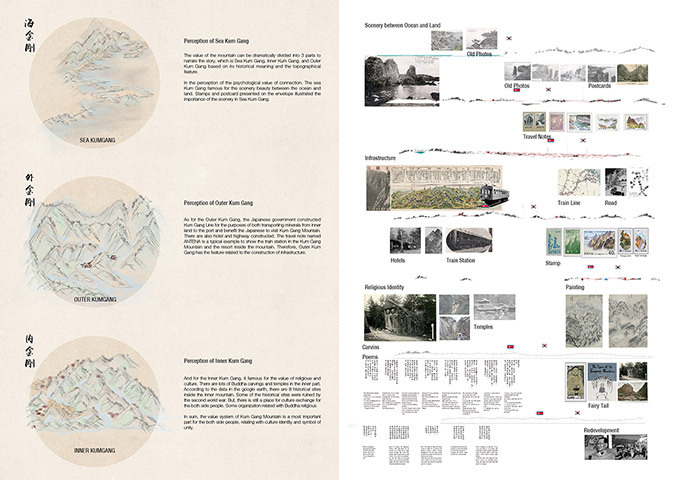 Through a strategic curation of the view, a landscape management system that could be applied to two countries with invisible cultural identity, the project emphasizes the duality of the Korean demilitarized zone, reframed the global, national, regional as well as the local perceptions of this military and cultural landscape.